Shades of Plein Air, Chicago, IL, Jan 13-.Feb 3. This is a special showcase of select Plein Air Painters of Chicago work. Opening night is Saturday, January 13 from 6-9:00 pm at the Palette and Chisel. ArtFest - Michigan Aveunue, Chicago, Illinois, July 20-22. Artfest is a newer show in the heart of downtown excellent for showcasing Chicago urban cityscapes. Additional information is available on the Artfest website. Port Clinton Art Festival, Highland Park, Illinois, August 25-26. Port Clinton is a top rated juried fine art festival. Additional information is available on the Port Clinton Art Festival website. Barrington Art Festival, May 27-28. This fair is located in downtown Barrington, Illinois. Additional information is available on the Barrington Art Festival website. Old Town Art Festival, June 10-11. This is the #1 rated art festival in the country and a must visit for Chicagoland art patrons. Come see me in booth 54. Additional information is available on the Old Town Art Festival website. Art at the Glen Town Center, Glenview, Illinois, August 5-6. Art at the Glen is near several fun shops and restaurants in a great suburban community. Additional information is available on the Art at the Glen website. Art & Big Fork Art Festival, Evanston, Illinois, August 18-20. This local festival is going to feature great live music and foodie entertainment besides art. Additional information is available on the Evanston Art and Big Fork Festival website. Winner of Outstanding Achievement: Painting. West Loop Art Festival, Chicago, Illinois, September 16-17.This new show is in a hot neighborhood with great music. Additional information is available on the West Loop Art Festival website. Plein Air Painters of Chicago Show, Chicago, Illinois, Sept 15-24, at the Palette and Chisel Opening reception is Friday night from 5-8:00pm. Come meet the artists and shop for fabulous OOAK Monet-style, authentic fully hand-executed local landscapes and cityscapes. Paint the Town - Northbrook Inaugural Plein Air Painting Festival, Northbrook, Illinois, October 6-8. This new event will have two competitions plus demonstrations by local plain air artists. Additional information is available on the Northbrook Arts Comnission website. "In the Hood" - Jackson Junge Gallery, Chicago, Illinois, November 10-January 31. Opening reception is Friday night, Novemeber 10 from 6-10pm. This show features local Chicago neighborhood work. I will have three pieces. Additional information is available on the Jackson Junge website. The Garage Sale Art Fair, Feb 27, Kalamazoo, Michigan. 150+ high caliber artists are having an inventory sale with their best (or only) discounts of the year on older and slightly damaged piece. Check out the artists on the Garage Sale site. "Nature's Palette", Skokie, Illinois. This is the Skokie Art Guild's Spring member show and will be held again at the Emily Oaks Nature Center from March 6-May 5. The opening reception is Friday, March 6 at 7:00pm. I will be featuring "First Blades". One of a Kind Spring Show and Sale, Chicago, Illinois, April 29 - May 1. This huge indoor art and handmade gift goods expo is located in the Merchandis Mart featuring 300 artisans. Additional information is available on the One of a Kind Spring website. 57th Street Art Fair, Chicago - Hyde Park, Illinois, June 4-5. This top festival is renowned for its strick One of a Kind only policy (no reproduction prints). I will be exhibiting my local plein air paintings. Additional information is available on the 57th Street Art Fair website. Gold Coast Art Fair, Chicago, Illinois, June 18-19. The fair is located this year in Grant Park. Gold Coast is the biggest Chicago art fair, highly rated, and should not be missed. Additional information is available on the Gold Coast Festival of Art website. North Shore Festival of Art, Skokie, Illinois, July 23-24. Skokie is my home and this festival is in a great location in the Old Orchard Mall. Additional information is available on the North Shore Festival of Art website Winner of Best in Category: Painting. Port Clinton Art Festival, Highland Park, Illinois, August 27-28. Port Clinton is currently rated #5 in the country for juried fine art festivals. Additional information is available on the Port Clinton Art Festival website. West Loop Art Festival, Chicago, Illinois, September 17-18.This new show is in a hot neighborhood with great music. Additional information is available on the West Loop Art Festival website. Winner of Outstanding Achievement: Painting. Starving Artists Festival, Highwood Illinois, September 24-25.This new show is set up for older and slightly damaged work to be sold at a discount. Look for my barns and European scenes.. Additional information is available on the Starving Artists Festival website. Oil Painters of America Salon Exhibition, Fort Wayne, Indiana, September 30-Oct 29. This national collection of some of the finest American representational art by living artists in a smaller format will have its opening reception on Friday, September 30th from 5:30-9:0pm. My painting, "Ornaments", has been accepted. Additional information is available on the Oil Painters of America website. Art & Big Fork Art Festival, Evanston, Illinois, September 30-Oct 2. This local festival is going to feature great live music and foodie entertainment besides art. Additional information is available on the Evanston Art and Big Fork Festival website. Winner of Outstanding Achievement: Painting. Plein Air Painters of Chicago Show, Chicago, Illinois, Dec 2-11, at the Palette and Chisel Opening reception is Friday, December 2 from 5-8:00pm. Come meet us! Global Cityscapes - The Art of Joy Appenzeller Bauer, March 2- April 30, Skokie, Illinois. Come see 14 of my signature series cityscapes at the Devonshire Cultural Center. 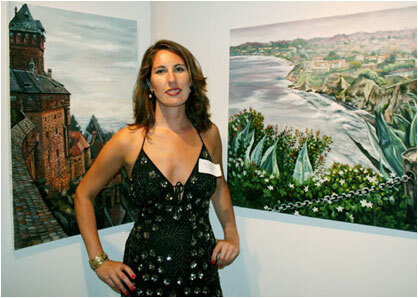 "Landscapes, Seascapes, Skyscapes", Las Laguna Gallery, Laguna Beach, California. This is a national competiton group show running from March 5-27. The opening reception is Thursday, March 5 at 7:00pm, 577 S. Coast Highway A-1 in Laguna Village at The Cliffs. I will be featuring invited work "No Lifeguard on Duty". More information on the show is available on the gallery website. "Nature's Palette", Skokie, Illinois. This is the Skokie Art Guild's Spring member show and will be held again at the Emily Oaks Nature Center from March 6-May 5. The opening reception is Friday, March 6 at 7:00pm. I will be featuring "Shady Creek". Barrington Art Festival, May 23-24. This fair is located in downtown Barrington, Illinois. Additional information is available on the Barrington Art Festival website. Winner of Outstanding Achievement: Painting. Gold Coast Art Fair, Chicago, Illinois, June 20-21. The fair is located this year in Grant Park. Gold Coast is the biggest Chicago art fair and should not be missed. 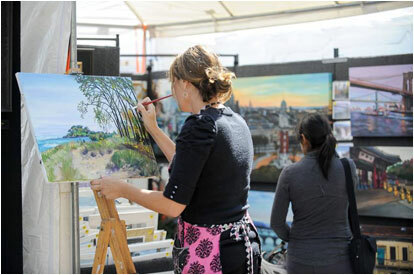 Additional information is available on the Gold Coast Festival of Art website. Fortunate Discoveries, Lincoln Park- Chicago, Illinois, July - July 2016. Some of my Chicago cityscapes will now be represented full time through this art and design gallery as well as my entire collection of limited edition Chicago giclee prints (25). Additional information is available on the gallery website. North Shore Festival of Art, Skokie, Illinois, July 25-26. Skokie is my second home in a great location next to the Old Orchard Mall. Additional information is available on the North Shore Festival of Art website. Winner of Best in Category: Painting. Art at the Glen Town Center, Glenview, Illinois, August 8-9. Art at the Glen is near several fun shops and restaurants in a great suburban community. Additional information is available on the Art at the Glen website. Port Clinton Art Festival, Highland Park, Illinois, August 29-30. Port Clinton is currently rated #5 in the country for juried fine art festivals. Additional information is available on the Port Clinton Art Festival website. Art & Big Fork Art Festival, Evanston, Illinois, September 18-20. This local festival is going to feature great live music and foodie entertainment besides art. Additional information is available on the Evanston Art and Big Fork Festival website. Plein Air Painters of Chicago Show, Chicago, Illinois, at the Edgwater Historical Society October 9-18. I will have four new pieces from Andersonville and other Chicago neighborhoods. Skokie Art Guild Fall Members' Show, Skokie, Illinois, at the Skokie Public Libary October 18-November 20. The opening reception is Sunday October 25 at 4:30pm. 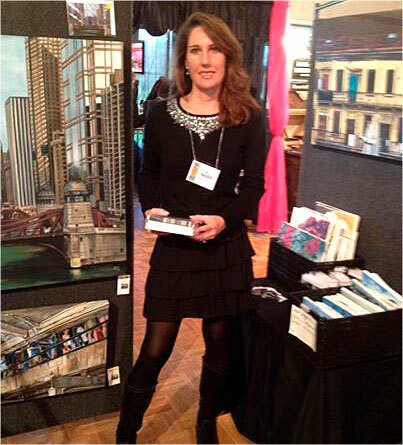 Plein Air Painters of Chicago Show, Chicago, Illinois, at the Palette and Chisel October 23-November 1. Join us for the opening reception on Friday night, October 23 5:30-8:30pm. The Nature of Edgewater, Uncommon Ground Art Show, Chicago, Illinois. This group show for local artists is on 1401 W. Devon and goes from November 5-January 25th. 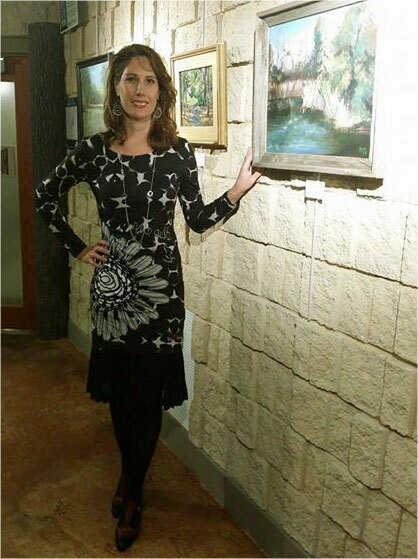 Brush with Nature Exhibit, Emily Oaks Nature Center (Skokie, IL) Nov 6 - Jan 3. The opening reception for the plein air painters group show is Friday, November 6th from 7-9pm. Additional information is available on the Brush With Nature website. Sights of Evantson, Noyes Cultural Arts Center (Evantson, IL) Dec 13- Jan 15. The opening reception for the plein air painters group show is Sunday, December 13th from 3-5pm. Additional information is available on the Anatomically Correct website. Brush with Nature Exhibit, Emily Oaks Nature Center (Skokie, IL) "Autumn Marsh" is an accepted work in this juried exhibit. The opening reception is Friday, January 10th from 7-9pm. Additional information is available on the Brush With Nature website. Richeson75 Small Works 2014, Jan 24-March 8. "Florida Foliage" is an finalist winning entry. The Opening Reception is on Friday, January 31, 2013 from 5:30pm – 7:30pm at Richeson Gallery, 557 Marcella St., Kimberly, WI 54136. Additional information is available on the Richeson Gallery website. Children at Play, February, 2014. This is an online competion where my painting of the same name, "Children at Play" won 1st Place. Visit the site to see the virtual show Focus Point Shape website. Women's Works, March 1- April 27, Woodstock, IL. This national juried show is produced by the Northwest Area Arts Council and is held at the Old Courthouse Art Center. My Stockholm painting, Commercial Crossing, will be featured. Additional information is available on the Womensworks website. Barrington Art Festival, May 24-25. This fair is located in downtown Barrington, Illinois. Additional information is available on the Barrington Art Festival website. North Shore Festival of Art, Skokie, Illinois, July 26-27. Skokie is my second home in a great location next to the Old Orchard Mall. Additional information is available on the North Shore Festival of Art website.Winner of Outstanding Achievement: Painting. Seascapes and Water, Contemporary Art Gallery Online, July show. The list of winners is available on the CAG website. Second Place Winner - Fine Art Painting. Art at the Glen Town Center, Glenview, Illinois, August 9-10. Art at the Glen is near several fun shops and restaurants in a great suburban community. Additional information is available on the Art at the Glen website. Port Clinton Art Festival, Highland Park, Illinois, August 23-24. Port Clinton is currently rated #5 in the country for juried fine art festivals. Additional information is available on the Port Clinton Art Festival website. Great Lakes 5th Annual Small Works Show, Riverside Arts Center, Ypsilanti, Michigan, October 2- 25th. My piece, "Red Lanterns" will be included as an accepted work. Opening reception will be on October 3rd from 5- 7. For more information, please visit the RAC website. Skokie Art Guild Fall Members' Show, Skokie, Illinois, October 18- November 15 at the Skokie Public Libary. Opening reception will be on Sunday, October 26th from 4-6:00pm. Anatomically Correct Plein Air Show, Skokie, Illinois, November 7- January 2 at the Emily Oaks Nature Center. "October Savanna" and "Watergate" are accepted works in this juried exhibit. Opening reception will be on Friday, November 7 from 7-9:00pm. 8th Annual Paint the Parks, El Dorado, Kansas (online in 2014 and dates of exhibition at the Coutts Museum TBD). 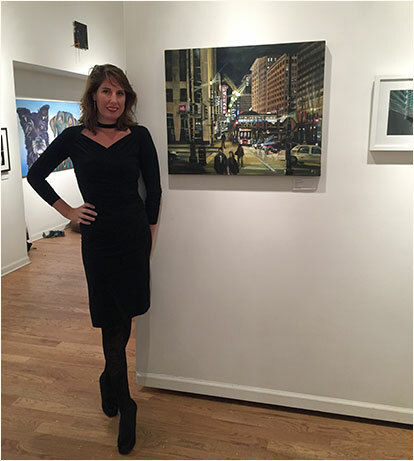 "Freedom Tower" is a full size winning painting in this juried exhibit. Look for more information to be posted on the Paint the Parks website. Foreign Imagaes, Linus Galleries "Nyhaven Street Canal" is an accepted work in their online juried exhibit. Additional information is available on the Linus Galleries website. Art for God's Sake, May 3-5 "Resurrection" is an accepted work and will be featured in the sacred art show in Troy, Michigan and also in their 2014 calendar. Additional information is available on the Art for God's Sake website. Richeson75 Landscape, Seascape & Architectural 2013, June. "Street Crew" is an finalist winning entry. The Opening Reception is on Friday, May 31, 2013 from 5:30pm – 7:30pm at Richeson Gallery, 557 Marcella St., Kimberly, WI 54136. Additional information is available on the Richeson Gallery website. Men, Linus Galleries "Street Crew" is an accepted work in their online juried exhibit. Additional information is available on the Linus Galleries website. Barrington Art Festival, May 25-26. This fair is located in downtown Barrington, Illinois. Additional information is available on the Barrington Art Festival website.Winner of Outstanding Achievement: Painting. Gold Coast Festival of Art, Chicago, Illinois, June 29-30. The fair is located this year in Grant Park. Gold Coast is the biggest Chicago art fair and should not be missed. Additional information is available on the Gold Coast Festival of Art website. Buffalo Grove Invitational Art Festival, Buffalo Grove, Illinois, July 13-14. Buffalo Grove is near my office/corporate job in a great suburban community. Additional information is available on the Buffalo Grove Invitational website. North Shore Festival of Art, Skokie, Illinois, July 27-28. Skokie is my second home in a great location next to the Old Orchard Mall. Additional information is available on the North Shore Festival of Art website.Winner of Outstanding Achievement: Painting. Art at the Glen Town Center, Glenview, Illinois, August 10-11. Art at the Glen is near several fun shops and restaurants in a great suburban community. Additional information is available on the Art at the Glen website. Bucktown Arts Fest, August 24-25. The fair is located at the Holstein Fieldhouse Park in the charming and trendy Chicago Northwest neighborhood, Bucktown. Additional information is available on the Bucktown Arts Fest website. The Inside Show, Highland Park, Illinois, November 22-24. This winter festival option will be a small indoor boutique type show featuring fine-crafted goods and wearables as well. Addtional information is available on the The Inside Show website. Richeson 75 Landscape, Seascape & Architecture 2012 April 16-June 8. Kimberly, Wisconsin. Opening reception is Friday, April 20. "Blue Period" is a finalist winning entry. Additional information is available on the Richeson Gallery website. Barrington Art Festival, May 26-27. This new fair is located in downtown Barrington, Illinois. Additional information is available on the Barrington Art Festival website. Winner of Best in Category: Painting. Eastside Millennium Art Festival, June 1-3. This big Chicago fair is located in downtown Chicago just North of the Art Institute. Additional information is available on the Eastside Art Festival website. Barrington Area Library, June 1- July 29. Barrington has one of the nicer library art galleries and some excellent exhibits. 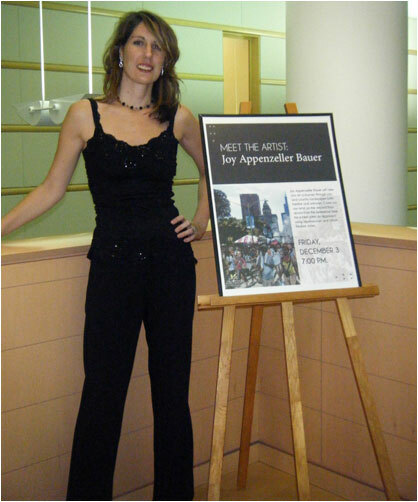 I am the featured Summer artist (solo exhibition of my International collection). My opening reception is Friday, June 8 from 7-9:00pm. 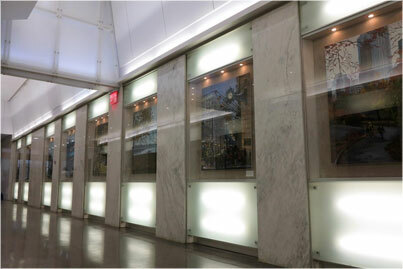 Additional information is available on the Gallery at the Library website. Gold Coast Festival of Art, Chicago, Illinois, June 30-July 1. The fair is located this year in Grant Park. Gold Coast is the biggest Chicago art fair and should not be missed. Additional information is available on the Gold Coast Festival of Art website. Buffalo Grove Invitational Art Festival, Buffalo Grove, Illinois, July 21-22. Buffalo Grove is near my office/corporate job in a great suburban community. Additional information is available on the Buffalo Grove Invitational website. Winner Outstanding Achievement: Painting. North Shore Festival of Art, Skokie, Illinois, July 27-29. Skokie is my second home in a great location next to the Old Orchard Mall. Additional information is available on the North Shore Festival of Art website. Art Fair on the Square, September 2-3. The fair is held in beautiful historic Market Square in Lake Forest, Illinois. Additional information is available on the Deerpath Art League website. Art in the Barn, Barrington, Illinois, September 22-23. The fair is located on the grounds of Good Shepherd Hospital (Route 22). "Nature's Palette", Skokie, Illinois. This is the Skokie Art Guild's Spring member show and will be held again at the Emily Oaks Nature Center from March 11-May 3. The opening reception is Friday, March 11 at 7:00pm. I will be featuring "Lake Monroe". Barrington Art Festival, May 28-29. This new fair is located in downtown Barrington, Illinois. Additional information is available on the Barrington Art Festival website. Eastside Millennium Art Festival, June 3-5. This big Chicago fair is located in downtown Chicago just North of the Art Institute. Additional information is available on the Eastside Art Festival website. Gold Coast Festival of Art, Chicago, Illinois, July 9-10. The fair will be located this year in Grant Park. Gold Coast is the biggest Chicago art fair and should not be missed. Additional information is available on the Gold Coast Festival of Art website. Art at the Glen Town Center, Glenview, Illinois, August 6-7. Art at the Glen is near several fun shops and restaurants in a great suburban community. Additional information is available on the Art at the Glen website. Bucktown Arts Fest, August 27-28. The fair is located at the Holstein Fieldhouse Park in the charming and trendy Chicago Northwest neighborhood, Bucktown. Additional information is available on the Bucktown Arts Fest website. Winter Art Festival, Highland Park, Illinois, December 2-4. This new winter festival option will be a small indoor boutique type show featuring fine-crafted goods and wearables as well. Addtional information is available on the Winter Art Festival website. The Noodle Cafe, Wilmette, Illinois. I will be showing about 10 larger pieces at this upscale North Shore Italian restaurant during the months of March and April. "Nature's Palette", Skokie, Illinois. This is the Skokie Art Guild's Spring member show and will be held again at the Emily Oaks Nature Center from March 12-April 27. The opening reception is Friday, March 12 at 7:00pm. I will be featuring "Ponies for Hire". 3756 N. Clark Street, Chicago, Illinois - Sunday, March 28 from 2-7pm. This show will featuring sports-themed art from various Chicago artists. Richeson 75: Small Works Competition, April 7-June 7. Kimberly, Wisconsin. Opening reception is Saturday, April 17. "Julep: Taking a Break" is a finalist winning entry. Additional information is available on the Richeson Gallery website. Chicago Art Open, Chicago, Illinois. The exhibition is April 20-25; opening reception is Tuesday, April 20th at River East Art Center, 6-9pm . For more information, please visit the CAC site. Barrington Art Festival, May 29-30. This new fair is located in downtown Barrington, Illinois. Additional information is available on the Barrington Art Festival website. Suppes Kitchen & Home, 2010, Barrington, IL. This is a furniture and home decor boutique located at 113 W. Northwest Highway. My entire rustic barn collection is available exclusively at Suppes. The shop is open Wed-Saturday, 10-5:00pm. 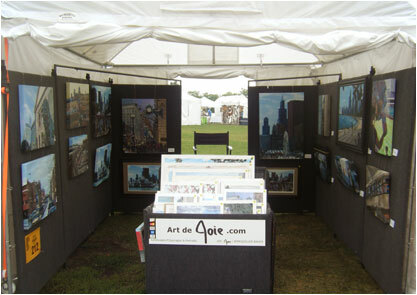 Hinsdale Fine Art Festival, June 12-13, Hinsdale, Illinois. Click here for the fair map. Received Honorable Mention from show judges. Cantigny Fine Art Festival, June 19-20. Cantigny Park, Wheaton, Illinois. Additional information is available on the Cantigny Fine Art Festival website. Skokie Art Guild Art Fair, Skokie, Illinois. July 10-11. The fair is located on 5211 Oakton, on the Village Green. Additional information is available on the Skokie Art Guild website. Gold Coast Festival of Art, Chicago, Illinois, August 20, 21,22. The fair will be located this year in Grant Park. Gold Coast is the biggest Chicago art fair and should not be missed. Additional information is available on the Gold Coast Festival of Art website. Bucktown Arts Fest, August 28-29. The fair is located at the Holstein Fieldhouse Park in the charming and trendy Chicago Northwest neighborhood, Bucktown. Additional information is available on the Bucktown Arts Fest website. Art in the Barn, Barrington, Illinois, September 25-26. The fair is located on the grounds of Good Shepherd Hospital (Route 22). ARTitude, St. Charles Country Club, Illinois, October 23. Skokie Art Guild Members' Only Exhibit, Skokie Public Libray, October 17 - November 19. The opening reception will be Sunday, October 24, from 6-9pm. Received Honorable Mention from show judge. Karen Solem Gallery, "Female Form Show", November, 2010 -January, 2011, Elmhurst, IL. Opening reception is Friday, November 5, 5:30-8:30pm. National Art Museum of Sport, "Commitment to Excellence in ART and SPORT: A Fine Art Competition" exhibit November 15, 2010, to April 11, 2011. (Indianapolis). Visit the NAMOS site for more information. My painting, "Anticipation 1" of Soldier Field will be on exhibit as a competition finalist. Bucktown Bazaar, November 27-28. This is an art and craft holiday show held at the Holstein Fieldhouse Park. Solo Exhibition at the Orland Park Public Library, Orland Park, Illinois, December. The "Meet the Artist" event will be held on December 3. For more information, please refer to the library calendar. Please visit me between 10:00am and 5:00pm at the fairs on Saturday and Sunday. I look forward to showing you my work in person. Karen Solem Gallery, Elmhurst, Illinois. Artists' reception is March 6th, 5:30-8:30. Click here for an eInvitation to the BEACHES show. "Communication is Overrated", Refuge Gallery, Skokie (IL). The exhibition is April 24-June 19; opening reception is May 1. I am a featured artist and have highly conceptual, expressionist work not available online or via other outlets. Self-Portrait Online Exhibition, 33 Collective Gallery. "Self-Portrait: My Hands" is featured as a merit entry beginning May 15. 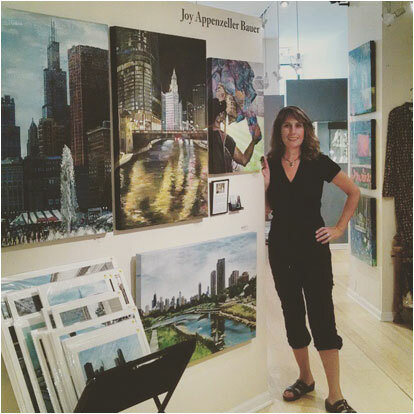 Studio 7013 Gallery, 7013 N. Sheridan Road, Roger's Park (Chicago). Opening reception for this new gallery is May 15. "Pasture Buddies" will be available as both an original and in two print sizes. Richeson 75: Still Life and Floral Competition, June 12-July 18. Kimberly, Wisconsin. Opening reception is Friday, June 12. "Sunbathing Grapes" is a finalist winning entry. Additional information is available on the Richeson Gallery website. Artists on the Bluff 2009 Festival of the Arts, June 13-14th. The fair is located on the Village Green in Lake Bluff, Illinois. Additional information is available on the Artists on the Bluff website. Cantigny Fine Art Festival '09, June 20-21. Cantigny Park, Wheaton, Illinois. Additional information is available on the Cantigny Fine Art Festival website. Skokie Art Guild Art Fair '09, July 11-12. The fair is located on 5211 Oakton, on the Village Green of Skokie (IL). Additional information is available on the Skokie Art Guild website. North Shore Festival of Art '09, July 25-26. The fair is located at the Old Orchard Mall in Skokie (IL). Additional information is available on the North Shore Festival of Art website. "Cutbacks" Show, Gallery 261, August 2009.Opening reception is Thursday, July 30th, 21 West Elm Street, Chicago, IL 60610. This is an art competiton for small 6x6" work. I have a rather whimsical/satirical piece included - which won the "Peoples' Choice Award". Optima Old Orchards Woods First Annual Art Fair, Saturday, August 22. This mini-fair is located at my Condominium complex on Woods Drive in Skokie, IL in the party room. 10% off for neighbors/residents! Bucktown Arts Fest '09, August 29-30. The fair is located at the Holstein Fieldhouse Park in the charming and trendy Chicago Northwest neighborhood, Bucktown. Additional information is available on the Bucktown Arts Fest website. Wilmette Art Guild Festival '09, September 12-13. The fair is located at the Metra Parking Lot on Lake Street and Green Bay Road in Downtown Wilmette, Illinois. Additional information is available on the Wilmette Art Guild website. Received Sponsor's Choice Award. Art in the Barn '09, September 26-27. The fair is located on the grounds of Good Shepherd Hospital, in Barrington (IL). Additional information is available on the Art in the Barn website. SAIC 2009 Barewalls, October 10, 6:00 pm, Sullivan Galleries, 33 S. State Street, Chicago. This show is the School of the Art Institute of Chicago's premier fundraising benefit. Tickets are available via Ticketmaster. Additional information is also available on the SAIC website. Richeson 75: Landscape Competition, Oct 16-Dec 31. Kimberly, Wisconsin. Opening reception is Friday, October 16. "Potomac View" is a finalist winning entry. Additional information is available on the Richeson Gallery website. Highwood Last Call Art Fair '09, October 17-18. This fair is designed to help artists sell off excess and slightly damaged inventory. Deep discounts will apply. I will be featuring several older pieces. Additional information is available on the Highwood Last Call website. Fall Show, Northwestern University Settlement CCT Gallery, October 26-December 11, 1012 N. Noble, Chicago, IL 60642. I will be exhibiting 8-12 pieces at this 5 person show. Additional information is available on the NU Settlement website. Opening reception is Friday, October 30, 2009 at 6:00pm. Bucktown Holiday Art Show '09, December 12-13. This fair is taking place in the Holstein Park Fieldhouse. Additional information is available on the Bucktown Holiday Art Show website. Michael Joseph Gallery, Ft. Lauderdale, Florida. Opening reception is December 5th, 6-9:00. Originals and prints are available. Visit artistshavengallery.com for details. Savanna House, Wadsworth, Illinois. Restaurant opened October 15th - Grand Opening is coming soon. Select pieces are available on consignment. Visit Savanna House at 38905 U.S. Highway 41. College of Lake County Community Gallery of Art, Grayslake Illinois. Opening reception was January 18. Summit, Libertyville, Illinois. View postcard PDF. Sign up for Art de Joie newsletter to receive 10% off one time use coupon. Check out my online clearance SALE - 40% off selected works!